Love the hand drawn spiky (??) look of these flowers. 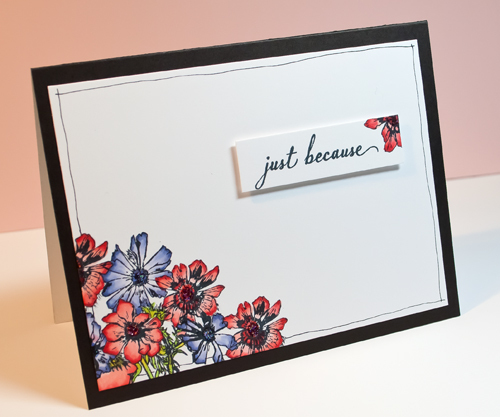 I loved the corner of bright flowers, the hand drawn lines, the sentiment popped up, and the use of a black card base in Julie's card. Stamped the top of the bunch of flowers and added a few flowers using the single stem in the set. Didn't bother to mask. Using Copics, colored 3 flowers in purple to form a triangle and then colored the remainder in shades of pink and red. Added Stickles in the center of the flowers because why not? TIP ON WORKING WITH DUPLEX CARD STOCK: To achieve the dark outside/white inside of this card stock, the manufacturer sprays black ink onto white card stock. Scoring and creasing the card can cause tiny cracks in the black. Score and fold gently, and if you see any cracks, use a black Copic or Sharpie to touch up. Eeep! This is stunning!!!! I particularly like the tiny flower on the sentiment panel for balance. But that black card stock would drive me nuts. Are AMuse and Hero Arts the same, with printing color? yes, they spray soy ink on the cardstock. made in america and supposedly more environmentally friendly. I think Memory Box, A Muse Studio and Hero Arts are identical. Just the colors are different. Love the contrast of the black background, lots of white with that wonderful pop of flower color in the corner! And popping up the sentiment! YEP!! Wow. Gorgeous. Love the popped-up sentiment, with the matching flower. Perfect. What a great idea to add a tiny flower to the sentiment - the perfect touch! You added some Stickles because it looks gorgeous!! 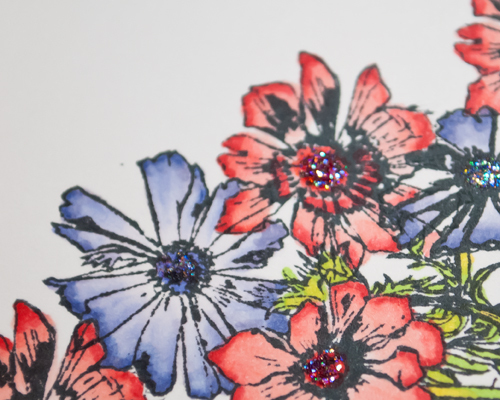 I love anemones, and Flourishes do make the most beautiful flower stamps. A neat design tip to start with the triangle - just like flower arranging! I'd never have thought of it, though. Gorgeous card Joan. Your coloring looks wonderful. I really love the layout of this card. Yup, gotta love the addition of bling that Stickles add ... I've been known to pull mine out. Rock Candy is awesome - if you haven't tried that one, give it a go. It is a cool sugary look.